"Every day I remind myself that my inner and outer life are based on the labors of other men, living and dead, and that I must exert myself in order to give in the same measure as I have received and am still receiving." Albert Einstein was a theoretical physicist, philosopher and author who is widely regarded as one of the most influential and best known scientists and intellectuals of all time. A German-Swiss Nobel laureate, he is often regarded as the father of modern physics. He received the 1921 Nobel Prize in Physics "for his services to Theoretical Physics, and especially for his discovery of the law of the photoelectric effect". Einstein published more than 300 scientific along with over 150 non-scientific works, and received honorary doctorate degrees in science, medicine and philosophy from many European and American universities; he also wrote about various philosophical and political subjects such as socialism, international relations and the existence of God. 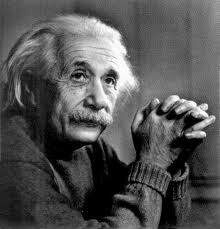 His great intelligence and originality has made the word "Einstein" synonymous with genius. One of my favorite books from Einstein is "The World as I see it". You can read it online for free here(scribd.com) or buy it on Amazon if you like reading a real book. This book reveals, the thoughts of the great mind known as Albert Einstein. His social life was as enlightening, as his intellectual mind. He had god given gift of opening god's secrets, and he did it beautifully, and humbly. He says,"The real valuable thing in the pageant of human life seems to me not the State, but the creative individual, the personality: it alone creates the noble and sublime." Einstein in his humble away talks about the dependence of the individual on the contributions of so many others in society. And he talks about the fundamental values for which he has lived, Truth, Goodness and Beauty. Lets us read some of his quotes and try to enrich our lives. FREE Subscription - Click here to get articles like ' Einstein on Life - 10 Simple Lessons ' in your Email.